Around here I only cook breakfast on the weekends. While I prefer something sweet (such as Monkey Bread), my husband prefers eggs and bacon. Cooking eggs for four different people, who each prefer them cooked differently, and trying to keep them warm, is a challenge. My sister sent me this recipe and it is quickly becoming a favorite around here. The crescent rolls form a thin crust on the bottom. If you pre-cook the sausage the night before, breakfast comes together in a snap. Preheat oven to 350. Unroll crescent rolls and press into the bottom of a lightly greased 9×13 baking dish. Top with cooked sausage. Blend eggs, milk, salt and pepper together and pour over sausage. Top with cheese. Bake 25 minutes or until the eggs are set and the top is golden brown. 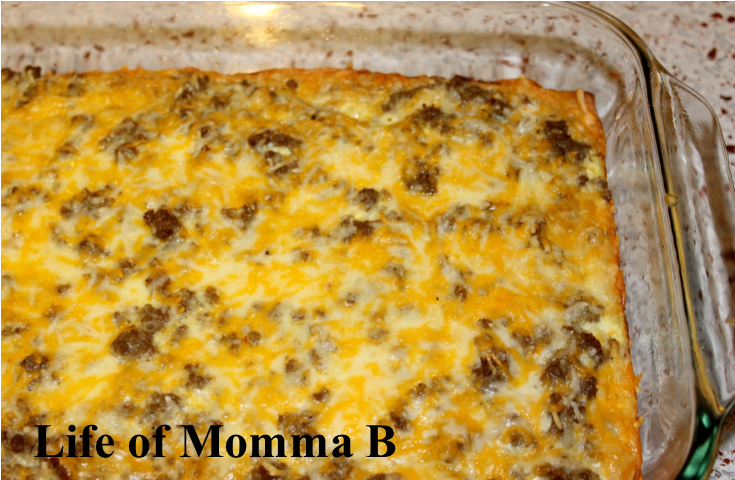 This entry was posted in Recipes and tagged breakfast, cheese, eggs, main course, sausage. Bookmark the permalink.